In many mammals the function of the pheromones passed with the urine is to signal the reproductive status of females. Observations by a number of research workers have shown that males of many mammal species sometimes make a distinctive grimace, a kind of lip-curling, when they encounter the urine of females of their own species. This grimace is known as 'flehmen', and typically it is made by the animal standing with its head stretching up and its mouth open while it retracts the upper lip, thus baring the gum and wrinkling the nose. Sometimes the animals make rapid licking and mouthing movements during or after showing flehmen. Although its precise function is not known, flehmen often occurs before or during early courtship, and it is believed to be involved in the olfactory testing of the female's urine by the male to determine her state of sexual readiness. Flehmen has been observed in a wide spectrum of mammals, ranging from bats to dugongs and including most of the hoofed mammals, and it has been recorded in the southern hairy-nosed wombat. During the preliminary phase of courtship between captive animals, Matthew Gaughwin observed flehmen on a number of occasions when the male sniffed intensely at areas of ground where the female had previously urinated and once when the male had sniffed the female's cloacal region. While he was sniffing, the male hairy-nosed wombat moved his nostrils backward and forward erratically, occasionally snorting and pawing the ground with the front foot. After sniffing intensely for several minutes the male raised his head and showed flehmen by retracting his split upper lip, causing the lip to move sideways and upward and exposing the large incisors. Bouts of sniffing, interspersed with flehmen, continued for up to 20 minutes. Gaughwin also made an observation in the field of a male hairy-nosed wombat showing flehmen when it stopped near a burrow to sniff a pile of scats. Flehmen also occurs in bare-nosed wombats. 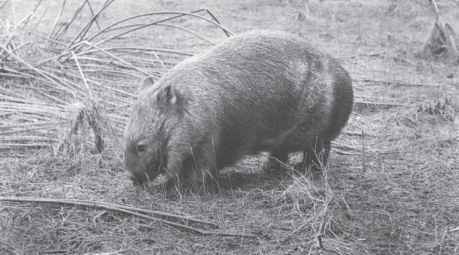 Graham Brown observed it in wombats in the Kosciuszko National Park, and I have seen it exhibited on two occasions by an adult male wombat that regularly visited my home. On the first of these, a female who was then nearly two years old had entered the house a few hours before the male and had deposited a pile of scats outside the wombats' entry door. The male paused at the pile of scats for several minutes, moving his head backward and forward over them with his nostrils dilated widely; then he lifted his head slightly and grimaced in the way that Gaughwin had described. He also mouthed and salivated while sniffing the scats. He showed flehmen several times before leaving the scats, but he then appeared to have no further interest in them, not even pausing as he passed them on leaving the house an hour or two later. The second time I saw this male exhibit flehmen was in a similar situation in the field to the one described by Gaughwin. The wombat, which had just left a major burrow late in the afternoon, stopped to sniff one of several piles of scats that were scattered near the mound. He sniffed the scats, raised his head and grimaced, and then pawed the ground with one front foot. He then turned and deposited some scats of his own very close to the pile he had sniffed, scratching the ground vigorously as he did so. Adult wombats rarely urinate, but they do occasionally produce very small quantities of urine at the same time as they produce scats. It is not possible to say whether this wombat was showing flehmen in response to some urine on the scats, or to the scats themselves or to other secretions on the scats.